When Winston Dimel rolled through South Dakota defenders into the end zone, it happened in real-time. That may not seem out of the ordinary, as that’s a big part of the draw of “live” sports. I only mention this because, as the redshirt freshman plowed in for a score, my head told me that I had seen it before. That it was a rerun. That a Kansas State fullback showing no regard for human life, relishing every bit of contact, doing all that he can to get ONE MORE YARD, is like the song that everyone knows. (Wildcat Victory, naturally.) My head was partly right. Dimel ran like guys you have seen in the K-State backfield. He was not the only one whose performance had me living in a nostalgic world on Saturday, either. Here are the three new* Wildcats whose performances – however brief they were – brought to mind Wildcats of yesteryear. *Sure, redshirts were technically “new” last season, but we’re going off playing time here. Dimel looks like the classic Snyder fullback. “Hard-nosed” may be both a strange adjective and a cliche, but I think it may accurately describe Dimel. Would he ram his helmetless face nose-first into a pile of defenders if it meant that the Wildcats would pick up an extra yard? I think he might. When I saw Dimel carry the football, I saw Travis Wilson toting one of his limited, but effective carries. I heard the PA echoing “GOOOLS-by,” not Dimel, after the rumble and tumble. Will Dimel – who carried eight times for 29 yards and two touchdowns on Saturday – see a ton of carries in his Wildcat career? It’s not likely. But the fact that he is already usurping some playing time from Glenn Gronkowski means that the coaches love what he does in the blocking game, and that will earn him more and more playing time. Is Silmon already K-State’s best running back? The depth chart may not reflect that idea, as Charles Jones sits on the throne at running back, but Saturday seemed to argue strongly in favor of No. 32. Silmon’s agility stood out to me more than anything else as he led the Wildcats in rushing with six carries for 51 yards. At 5-10, 191 lbs., his size/speed/athleticism combination matches a pair of Wildcat running backs from the mid-90s. Mike Lawrence carried a similar frame for the Wildcats from 1994-1997, breaking J.J. Smith‘s career rushing record by the time he graduated. Eric Hickson lined up at 5-8, 200 lbs. He broke Lawrence’s career rushing record one year later. Silmon has the quicks, and he showed some patience looking for holes from the offensive line. Can he set records at K-State? Well, some guy named Sproles has since scribbled his name all over the Powercat-adorned record book, but the freshman rushing record could be in sight. 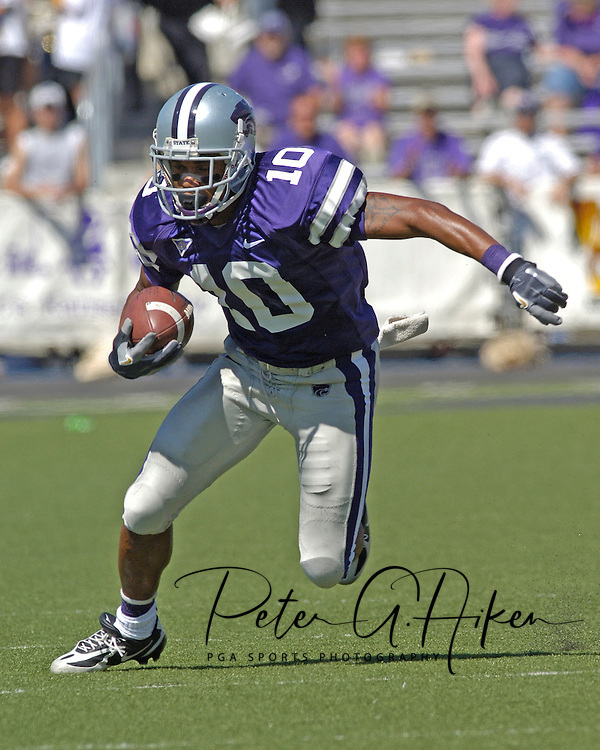 The record-holder: Leon Patton, who rushed for 609 yards as a frosh in 2006… Let’s root for this to happen. The 5-9 Heath caught three passes for 54 yards and returned three punts for 52 yards against South Dakota. The list of diminutive wide receivers who doubled as return men at K-State is a somewhat lengthy one. Tyler Lockett was no giant, nor was his uncle Aaron. Tramaine Thompson could be a good comparison, but so could Yamon Figurs, or even Jermaine Moreira. There’s Brandon Banks and Deon Murphy if you’re willing to dip into the era that shall not be named. All stood under 6-feet tall. All had fleet feet and the sort of playmaking ability that had you feeling like something special could happen every time they were on the field. My favorite comp for Mr. Heath, though, is someone already on the sideline. Someone whom he sees at practice every day: coach Andre Coleman. Coleman helped bring the Wildcats to relevance of any sort as a huge piece of the 1993 Copper Bowl squad. He caught touchdown passes. He brought kicks back for touchdowns. When he had the football, he made plays. While I’d love to see Heath become the next Lockett, if he can become the next Coleman, that will be just fine. This is your standard disclaimer. Your legalese, inserted to cover my behind should Game One of these young men’s careers have been a mirage. It’s nearly impossible, and certainly foolish, to base one’s opinion of a player on a single game. But I’ll reiterate what I noted on Saturday: I like what I saw. Bill Snyder has made a career of making unheralded players into all-conference performers, and all three of these players could be the guys that we fondly remember when the class of 2025 comes around.